High-quality, one-part varnish provides a beautiful, long-lasting finish with maximum UV protection and water resistance. Available in high gloss and satin. Forgiving formula makes great results easy to achieve. NEW! 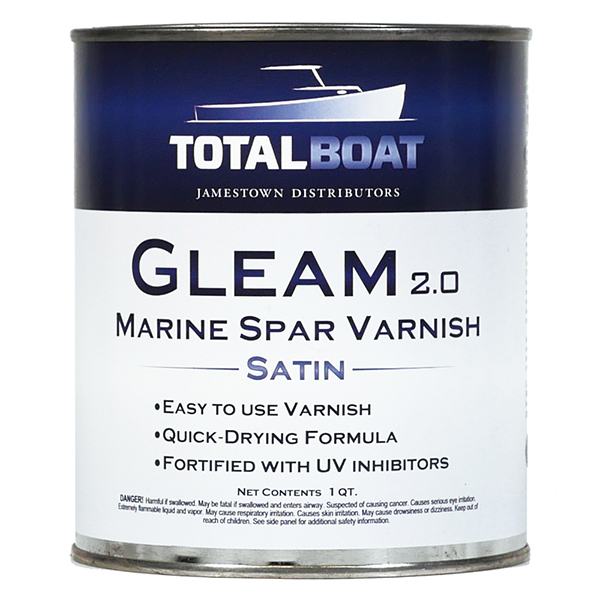 For a satin finish that has even better depth and clarity, Gleam 2.0 is also available in a Gloss & Satin 2-Quart Combo Kit that includes 1 quart of Gleam 2.0 Gloss Varnish and 1 quart of Gleam 2.0 Satin Varnish. 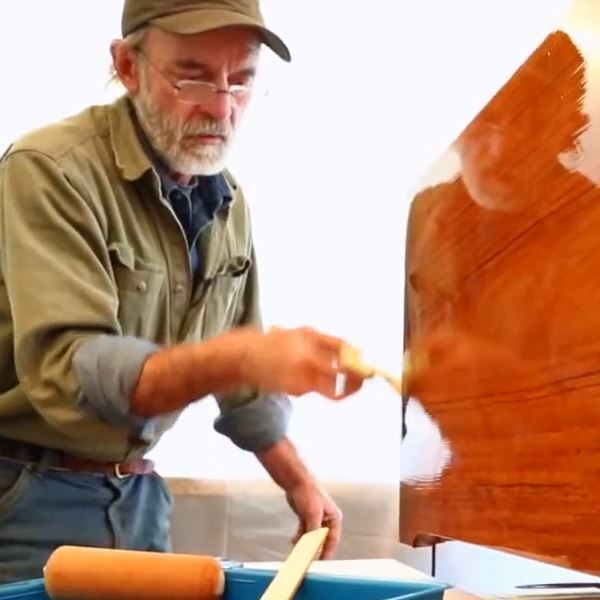 Apply the gloss first to create build coats with superior depth and clarity of the wood grain, then overcoat with a couple of coats of satin to knock down the gloss and achieve the desired velvety satin finish. Gleam’s transparent gloss and satin finishes enhance the shine and durability of the surfaces they’re applied to. Gloss Gleam is very shiny and very smooth. It’s a little easier to clean, which makes it great for hand rails and trim. Satin Gleam brings out the natural beauty of the wood grain with a finish that’s much less shiny but no less durable. Satin was designed to boost the beauty of interior woods. It can also be used on deck areas that may become slippery when wet. Both Gleam finishes seal the beauty in and block the ravages of sun and moisture. This one-part varnish goes on easily, without much thinning. More solids are applied to the surface, resulting in a more durable, UV-stable coating that lays down flat with fewer air bubbles to knock down by tipping. Unless you’re in extreme temperature conditions, you should only need to thin the first coat as a sealer coat. As layers of Gleam are applied, the finish depth increases. This smooth surface can be sanded between coats and overcoated to build gloss or depth as needed, one coat at a time. Maintaining the finish is easy, too. Just apply a few maintenance coats every year to varnished areas that are exposed to direct sunlight. 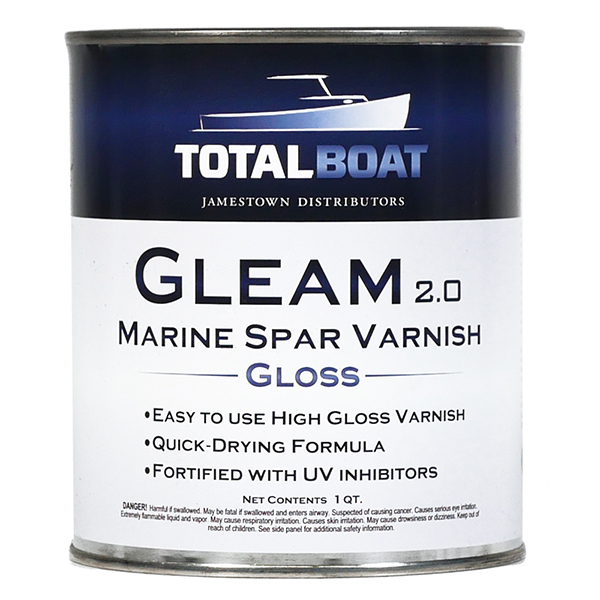 Application hint: TotalBoat Wood Sealer can also be used on new wood before applying Gleam 2.0 to avoid reducing on the first coat. Simply apply 2-3 coats of TotalBoat Wood Sealer on sanded and cleaned bare wood, allow to dry for 24 hours, and apply Gleam 2.0 as directed.